Cultural neighborhood is a community across ethnic boundaries that provides safety and nurtures belonging. It embraces enmity and amity, supports cultural diversity, heightens knowledge and facilitates resilience. Cultural neighborhood is place, sentiment and narration, flexible and yet full of rules. Cultural neighbors are aware of and interested in each other, they face each other, get used to each other and develop intimate acquaintance of each other’s differences and similarities through time, effort and creativity. 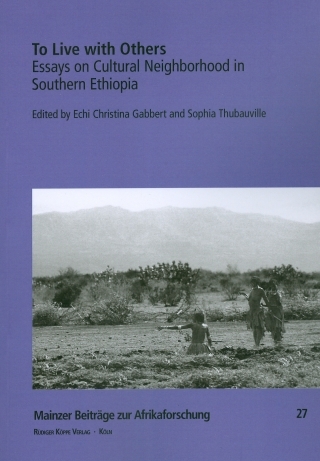 To Live with Others focuses on modalities of change and ongoing negotiation of contact phenomena among several groups in southern Ethiopia with a special interest on neighborly interaction. The volume also is an initial attempt to further develop the notion of cultural neighborhood. In thirteen essays the authors show how members of neighboring groups of southern Ethiopia position themselves while bring­ing their rules, sentiments, economies, rituals, desires and stories together. By looking at modalities of people, who live as direct, more distant or even temporary if not ephemeral neighbors it becomes ap­parent how knowledge about each other is challenged and formed continuously with all facets that human relationships might contain. The examples presented in this volume can also contribute to a better understanding of a global cultural neighborhood where conflict and peace are immanent, yet where mutual knowledge and respect prevail.